The Tape Core pedal! It`s a tribute for the legendary tape echo with a constrict size crystal clear, incredible ambient! Tape Core. A contemporary stomp box that offers classic Tape Echo tone. 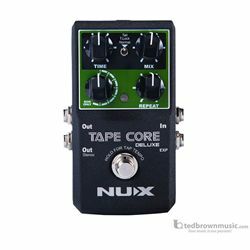 Just like the original Tape Echo, the NUX Tape Core features 3 reproduction heads yielding 7 different combinations of delay sounds. All of the natural sound, decay, modulation was created with our cutting-edge NUX TS/AC Technology! Tape Core is professional, convenient, and designed to echo your vision! The maximum parameters of the REPEAT knob can be used to recreate the classic Infinite Feedback Oscillation effect that was, until now, only available on the physical machine. This trippy sci-fi effect, made popular by artists like Pink Floyd and The Steve Miller Band, allows for super-cool song intros, interludes, and endings. Tape Core Deluxe comes with a 3-way toggle-switch allowing you to change between 2 Bypass modes and NUX’s unique Tone Lock (T-Lock) function. T-LOCK MODE: A physical dead-man switch designed to protect your parameter tweaks during your performance. NORMAL MODE: True Bypass which bypasses the effects circuit. TAIL MODE: Buffered Tail Bypass which maintains the effectl of the last note played. REPRO-HEAD EDITOR: You can edit in Real-Time or Note Pattern mode by using the SYNC slider. This allows you to use actual musical notes to create an infinite combination of groove patterns. 7 COMBO SELECTOR: This is used to re-assign your 7 Combinations, turn On/Off the AUTO TAP, and/or KILL DRY functions. AUTO TAP: You can use this function to turn On/Off NUX’s patented Smart-Tap Tempo. When not using Smart-Tap Tempo you need to HOLD your foot-switch 2 seconds and wait for LED indicator light to change color then TAP your speed. With Smart Tap Temp, just start TAPPING, and it automatically knows that anything past 2 TAPS is your desired tempo. KILL DRY: Dry meaning “ NO EFFECT” and Wet meaning “WITH EFFECTS”, there are situations where you need to “Kill the Dry”, for example: if you connect Tape Core Deluxe to an amp that is already running both the Wet and Dry signal in Parallel ( side-by-side ). The KILL DRY switch allows you to turn On / Off your Dry signal so there are no signal conflicts. FLUTTER, BASS, REVERB, SATURATION and TREBLE. So, to get as close to the original as possible, we included them!